As an elevator geek, I was very excited to see that this hotel had a swing door elevator, just like the Pines! I remember riding that elevator as a kid, and it always freaked me out. It was hard to believe that such an old elevator was still in operation. But as you can see here, it was not the only swing door elevator in the Catskills! First, what is a swing door? Modern elevators feature automatic sliding doors for both the inside and outside doors. But back in the day, it was common for hoistway doors to swing open under the power of a rider's push, like a normal door. The inside (car) door still was of the sliding automatic type, however, it featured no electric safety edge, just like the day it was installed by Seaberg Elevator. The reason that this elevator was still in service in this condition is to allow observant Orthodox Jews to ride the elevator on the Sabbath. Since Jewish law prohibits "creating fire" which apparently indirectly applies to using electrical circuits or otherwise influencing electric appliances, a sabbath elevator allows riders to step on and need not push any buttons or interrupt any pesky electric safety eyes to ride. 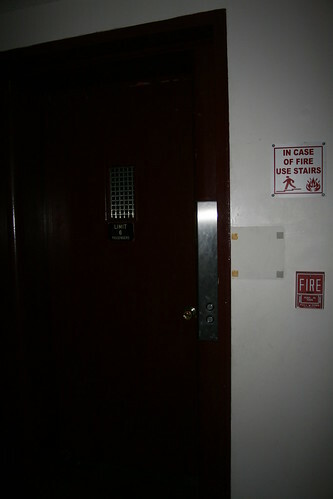 A sabbath elevator runs from the ground floor to the top floor, then stops at every floor on the way back down to the ground floor. This way, riders need not select a floor, as pushing a button would violate the rules.